BPI Family Savings Bank, one of the leading banks offering car loans, has launched its Safe Drive campaign as it looks forward to a safer and stronger auto industry this year. The Safe Drive campaign kicked off last month through a partnership with the local government of Tagaytay City, a favourite road trip destination of many motorists. "The partnership forged between the City of Tagaytay and BPI Family Savings Bank is a wonderful example of how effective public-private partnerships are in promoting a worthy advocacy," said bank president TG Limcaoco. "I believe that the value created by these partnerships, such as a potentially reduced number of accidents as well as growing number of visitors in our city, are sure to last." 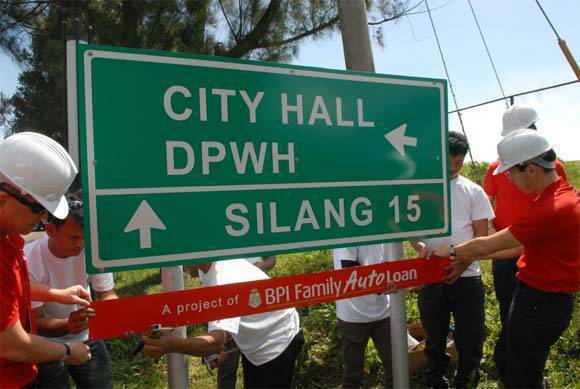 In line with BPI Family Bank's Safe Drive program, bank executives and local government officials drove around Tagaytay to install informational and warning signs to serve as reminders to people using the road. "BPI Family Savings Bank, through its auto loans division, is fully committed to helping the country's auto industry grow responsibly," said David Sarmiento, BPI Family Bank's senior vice president and head of auto loans division. "As more Filipinos are finding it easy to own their dream cars, we want to advocate responsible car ownership and safer road conditions for them." Sarmiento said other areas in the Philippines are also being eyed for BPI Family Savings Bank's Safe Drive program. "This is just the beginning," he added. "We hope to have similar endeavors in other key areas in the country to benefit more Filipinos." BPI Family Savings Bank is Top Gear Philippines' New Car Guide partner.